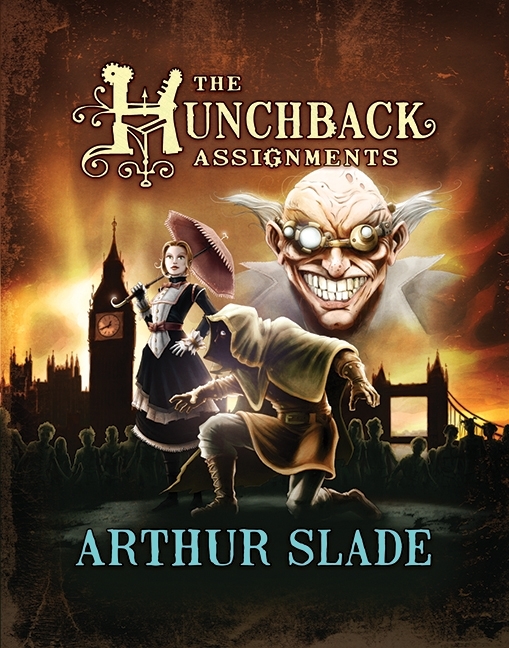 The Canadian cover for Hunchback Assignments. I far prefer Christopher Steininger's comic-style covers to the U.S. ones. I'd like to go for lunch with Arthur Slade. 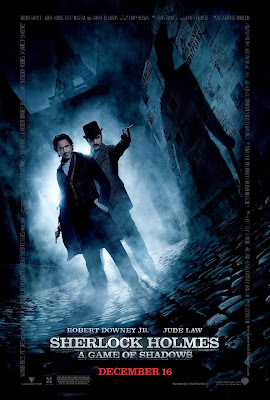 Not just because he's Canadian, although that came as a pleasant surprise to me when I first read The Hunchback Assignments in preparation for last year's blog tour promoting The Dark Deeps. I'd just finished up the first Canuck Steampunk series here at Steampunk Scholar, and was excited to find another writer for this year's series. 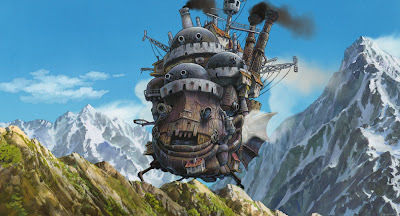 Nor because I tend to enjoy young adult steampunk more than the ostensibly mature and grown up steampunk. I also tend to enjoy romanticized steampunk adventure better, and the YA market seems more welcoming to such adventures. No, I think hanging out with Arthur Slade over food would be a good time because he loves monsters, in a way that reminds me a little of Mike Mignola's work, albeit with a focus on the classic Universal monsters from the nineteenth century. Maybe it's just my imagination, but those monsters seemed more popular back in the 70s, with Warren Publishing and a heap of movie magazines devoted to old school monsters. Or maybe it was just my own preoccupation with them. I resonated strongly with Mark Petrie in Stephen King's Salem's Lot, who knows how to deal with vampires, steeped in their cinematic lore, and prepared with a cross to ward them off from a monster model kit. I never built the models myself, but I gazed at them longingly. By the time I was in grade three, I knew who Lon Chaney was, both junior and senior, and tried to dress up as the silent era Phantom of the Opera for Halloween, only to be repeatedly mistaken for a fangless Dracula. I wanted badly to try to make costumes in the way Lon Chaney Sr. had as the Hunchback of Notre Dame, but my mom wouldn't let me use an egg white to blind one eye, the silly putty I used to make prosthetics wouldn't stay on my face, and the pillow I used for a hump kept shifting. I don't know if it was an odd choice for playing pretend, but it was my choice. Slade admitted his fandom of these classic monsters, and watching the silent Hunchback with Chaney Sr. as inspiration for the hero of The Hunchback Assignments, Modo, Quasimodo reimagined in delightful recursive fantasy. While it's a bit of a spoiler to reveal Modo's powers, they come early enough to act more as a teaser. Modo is as hideous, perhaps moreso, than his silent-era cinematic twin, but unlike all Quasimodos before him, is able to transform his body into any human shape, facial features and all. Mr. Socrates, a mysterious agent of the crown, discovers Modo as an infant and buys him, effectively rescuing him from a life as a sideshow freak, to become the ultimate spy. Slade adds these shapeshifting powers to Quasimodo's trademark climbing ability, pairing that with a Spider-man like ability to navigate the rooftops and spires of London: "He'd spent nearly every night of the past six months on these rooftops. They belonged to him now, the only place he felt free. he had each dormer and slanting surface memorized. He could get from his room to Trafalgar Square faster than any cab" (65). The plot is standard, as many young adult novels are. Instead, as with most successful young adult novels, the focus is on character development. Close escapes are not reason enough to turn the page and see what happens next. The reader must care deeply about the character, and Slade has written an endearing one in Modo. Modo provides the reader with the social retrofuturism of Hunchback Assignments, challenging and questioning the unswervingly British Mr. Socrates, giving the twenty-first century reader a window into the nineteenth century that doesn't feel antiquated. Further, Slade provides Modo with the character foil of Octavia Milkweed, the requisite romantic interest for Modo. Their ongoing relationship is one of the best aspects of the series, since Octavia finds herself attracted to Modo, but wonders at his true face: she only ever sees him in disguise, transformed and handsome. Octavia also provides an aspect of social retrofuturism, since she is a girl with initiative, spirit, and drive. Like many other steampunk heroines, she is a realization of the fin de siècle "New Woman," as teenage girl. And although The Hunchback Assignments' high adventure is targeted at Young Adults, Modo's is not an idealized world: his experiences would fit well alongside those of the Baudelaire children from Lemony Snickett's Series of Unfortunate Events, albeit bereft of the ironic tone. The relationship between Mr. Socrates and Modo is a difficult and complex one, hinting at Socrates' past, and openly declaring Modo's need for a parental figure. Modo's desire for love is one of the main themes of the series. Slade proves a deft hand with this part of the story, never giving the reader a trite or easy solution to Modo's problem. His appearance is hideous, but his soul is beautiful. As such, he challenges conventional young adult heroes and their stories. Unlike Kenneth Oppel's Matt Cruse, Modo has more than just social status to overcome: while he can change his appearance, the transformation is temporary. For Modo to find love will be to find someone who can love him as his true self. In this way, Modo moves through the same stages of Margaret Atwood's survival and victim I talked about last year in relation to Oppel's Airborn series. Modo's story focuses on the third position of Atwood's theory: "To acknowledge the fact that you are a victim but to refuse to accept the assumption that this role is inevitable" (37). Modo constantly struggles to live above seeing himself as only his appearance. Atwood states that it is in this position is about "repudiating the Victim role," moving from anger towards oneself or fellow-victims to "energy channeled into constructive action." Modo's journey is towards Position Four, "to be a creative non-victim"(Atwood 38). In this journey, Modo is aided primarily by two teachers, the maternal Mrs. Finchley, who discourages Modo from changing his appearance for her while she teaches him acting, history, and literature, and Tharpa, a former untouchable from Bombay, who does not cringe when he sees Modo: "Your disfiguration, it is not your true self," he tells Modo (Slade 32). These characters provide Modo with the encouragement he needs to move towards becoming a creative non-victim. This is what sets the high adventure of The Hunchback Assignments from lesser steampunk fare, although it's arguably always what makes a book worth reading: good characters make for good stories, and The Hunchback Assignments is full of great characters, both heroes and villains. Sure, it's got the requisite steampunk elements: there's technofantasy (though I can't reveal what it is, as that's the mystery Modo and Octavia are trying to unveil), the largely social retrofuturism I've already mentioned, and a neo-Victorian setting in a fantastic London of the nineteenth century. At the core of it all though is a monster's heart, that beats with heroic purpose, and it's why I've devoured every book of the series since my introduction to it last summer. Here in Canada, we're lucky enough to have already seen the release of book three, The Empire of Ruins, but Stateside readers will have to wait until this fall. 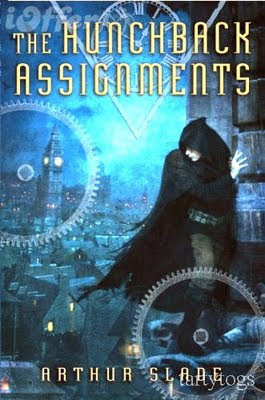 Either way, if you haven't started reading this excellent steampunk adventure series, there's still time to catch up. You've got your assignment, now get to it! While I'm a fan of Chris McGrath's photomanipulation approach on the U.S. cover, it doesn't feel right for the tone of the book. That said, the Canadian cover seems to play up the adventure, while the US ones go for a sort of neo-Gothic romance.